Hardwood floors have always been a popular flooring choice. However, they aren't the right floor for every situation. They don't do well in humid environments or rooms where water damage is a possibility such as kitchens and bathrooms. They have to be installed on a particular type of sub-floor which often limits them to the main level of the house. There is a way, however, to get the warmth and look of wood in any room of your house. Actually, we should say "wood-like" floors. Manufacturers have introduced new flooring products that look and feel like wood and overcome the few weaknesses that hardwood flooring has. Sounds like it's too good to be true? We assure you, it's true. Porcelain tile and resilient luxury vinyl floors are hot flooring trends right now and with good reason. These flooring options bring the beautiful appearance of wood into your home but with so much more flexibility. 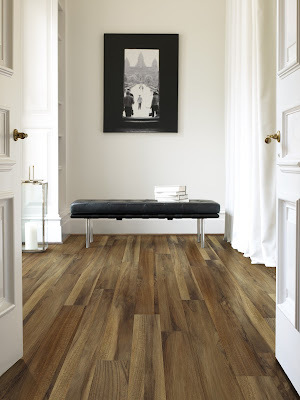 Porcelain tile gives you the durability and easy maintenance of a tile floor with the look of wood. Porcelain is denser, more porous, and harder than ceramic tile thus offering greater stain and water resistance. Stronger than granite and resistant to staining, porcelain is also easy to clean and offers superior wear resistance. What is resilient luxury vinyl flooring? Resilient flooring is a type of luxury vinyl created using high-definition printing so that it has a wood look that’s highly authentic. It’s designed to emulate the top species and colors of hardwood. Resilient floors give the look of hardwood without the high-maintenance. As an added bonus resilient wood floors also hide imperfections in subfloors and are waterproof. It is waterproof, making it a perfect choice for your kitchen, bathroom, basement or even laundry room. Many people love the look of hardwood floors in their kitchens, bathrooms or basements but hardwood is not the best choice for these areas. For years, laminate wood flooring has been the go-to option but still prone to damage from spills. Now resilient flooring and porcelain tile give homeowners the beautiful look of natural hardwood in any room. Stop by our Indianapolis flooring store showroom and check out these beautiful new flooring options for yourself!